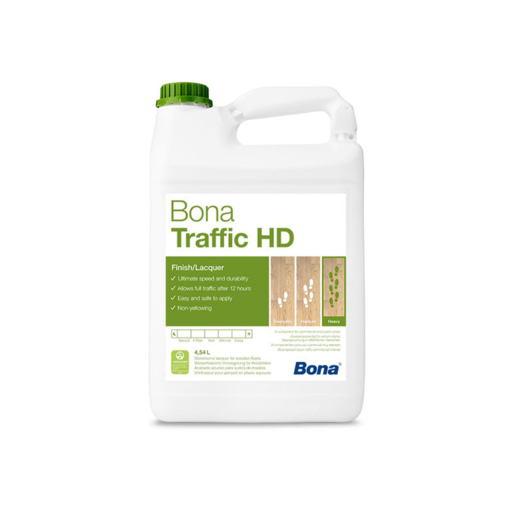 Bona Traffic HD in Matt sheen is designed for wood floor owners with an uncompromising demand towards durability. This lacquer outperforms all urethane finishes, including Bona Traffic, in durability at 24 hours. Traffic HD is a two-component, polyurethane, waterbased lacquer for the surface treatment of timber floors in commercial premises or wherever a high resistance to wear is required. It is suitable for overcoating compatible factory pre-finished timber and cork floors. Traffic HD provides a clear, natural appearance, giving almost invisible protection when the IP (Matt) version is used. However, unlike oil, it offers a simple level of maintenance.